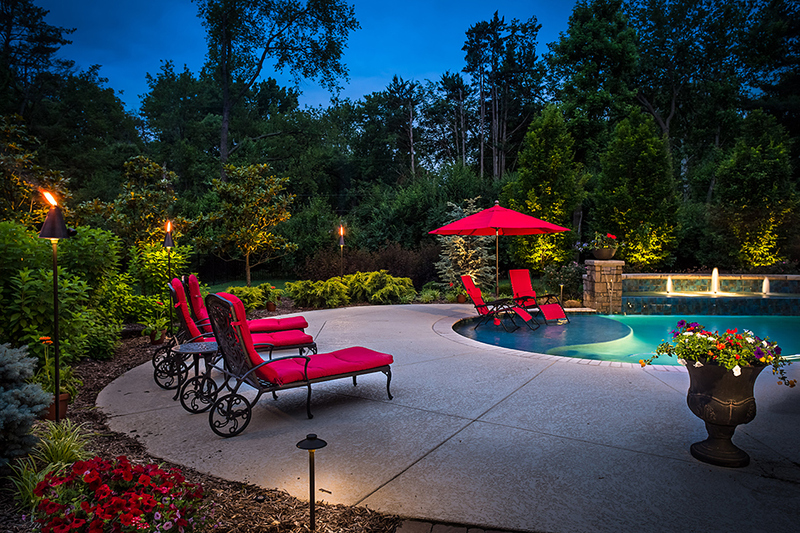 Tony Frisella Jr., owner of Frisella Outdoor Lighting, shines light on creating a personal and powerful outdoor ambience. You can change the entire look of a landscape or mood of an entertaining space through outdoor lighting. Frisella Outdoor Lighting has been lighting St. Louis area homes since 2006 with their combination of thoughtful design, friendly, personal service and quality lighting products on the market. SLHL: How do you develop a landscape lighting strategy for a homeowner? Tony: Since a home is typically the largest item on a project being illuminated, we take into account the architecture of the home. We look for features that make it stand out from neighboring homes, such as stone and brick transitions, ornamental chimneys, etc. Moving away from a home or structure, we look for landscape items that will give depth to the design or highlight dark areas that may make a lighting portrait look unbalanced. SLHL: How will landscape lighting benefit a homeowner's property? Tony: Lighting affects moods. The biggest point everyone seems to make about lighting is the safety aspect. While we are not disputing that this is a major benefit of lighting, we feel that lighting is much more. There is no better sense of pride and satisfaction than pulling up to your own home to a well-balanced and crisp illumination of your property. Lighting transforms atmospheres and can make spaces feel immensely larger or smaller than they do in the daylight. SLHL: What part of the yard should people highlight with lighting? Tony: If you entertain outside a lot, I would suggest the back yard where people will actually be experiencing the lighting. If people are lower key and just like simple, I would then suggest the front yard. SLHL: What is high-quality outdoor lighting? Tony: It is first a well thought-out design that achieves the homeowners’ intentions. Secondly, quality lighting is a system that has as few wire splices as possible and can be adjusted for plant growth over the years without having to splice in new wire. A quality system should not take hours to service unless there was construction damage. Set up correctly, systems should have a minimum of one-year service to ensure that there is no debris buildup in or around fixtures and no apparent damage, as well as time to make necessary placement adjustments. SLHL: What types of lights work best in outdoor environments? Tony: Fixtures made of brass are the best to be used outside. Brass fixtures make up almost 100 percent of all the fixtures our team installs. Over the years we have seen too many powder-coated fixtures corrode and paint peel with the manufacturers not standing behind their fixtures. SLHL: What is the simplest way to improve curb appeal with lighting? Tony: Start with the house, but do not highlight windows unless they are ornamental. Also, be sure that there are not large, dark gaps between lights. If dark spaces are too big, your eyes do not take in the whole project but jump around to the nearest light. Dark spots also make a project look very sporadic.